Plantar fasciitis (also known as plantar heel pain, plantar fasciopathy or a number of other names!) has traditionally been one of the more frustrating conditions to suffer from and especially puzzling to manage as therapists. Statistically, plantar fasciitis is the most frequent cause of chronic pain in the heel. It comprises 15% of all adult foot complaints and affects 10% of the general population. Long distance runners are the most susceptible to this issue, more than likely due to the volume and cumulative load applied to the plantar fascia over sustained periods of time. For those who have experienced this issue, you will know just how debilitating it can be. In order to help avoid the onset, we need to first understand what factors place us at risk. A BMI of 25-30 kg/m2 approximately doubles the risk of developing plantar fasciitis. Individuals in high weight bearing occupations are also 3.6 times more likely to suffer from plantar heel pain (Sahin et al. 2010). There are a number of more intricate biomechanical factors that may also increase the likelihood of suffering from this condition, including reduced extension range of the big toe. Until recently, treatment from allied health professionals managing this condition has been ‘reliably unreliable’. 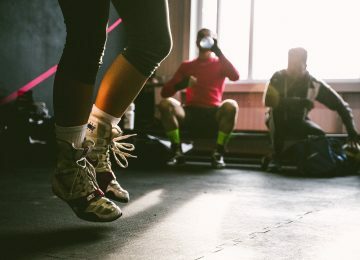 With interventions including stretching, orthotics or some other form of non-exercise treatment having a more positive effect than placebo alone, but still not giving us the pain and function changing clinical results we desire. Fast forward to 2014 and finally some high quality research by a man called Michael Rathleff became available to help guide us in our management of plantar fasciitis. 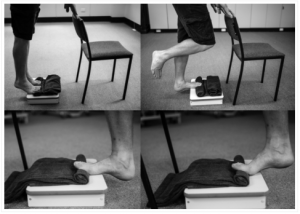 Basically, he showed that the plantar fascia responds most favourably to a high load strengthening protocol involving single leg heel raises, done at a slow pace with the toes elevated as in the picture below. So what’s the best route of treatment if you’re suffering from plantar heel pain? Gradually build the tissue capacity of your plantar fascia as you manage your activity in the interim. You can do this through slow (2 seconds up, 3 second hold, 2 seconds down) single leg calf raises with your toes elevated on a rolled towel. Research shows this will give you the best improvement in function. Start with 3 sets of 12 every second day. Sitting with your feet flat on the floor, keeping your heel still, claw your toes back towards your heel. Hold for 30 seconds, take a minute break and repeat this cycle 3 times. We don’t know why, but this helps alleviate pain. Spend the majority of your time in the shoes that are the most comfortable to you and give you the least pain. Receive taping from your therapist to help relieve the pain causing structures. Stretching or rolling of the arch of your foot. Start with 3 x 30 seconds everyday. P.s. Cortisone injections for this condition have found to have only a very short term improvement over placebo. We know cortisone isn’t good for our body’s tissues – so look to alternatives for relief!